or go straight to ticket selection here. 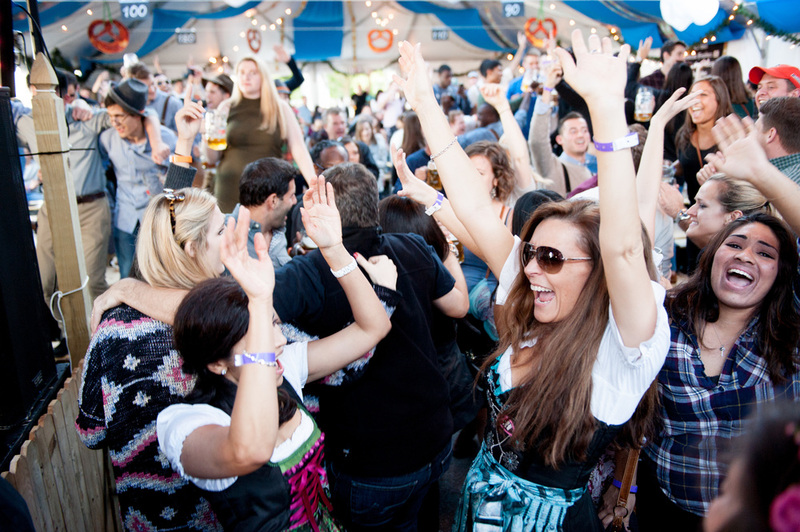 Zum Schneider, the original Bavarian Bierhaus in NYC owned by Sylvester Schneider, once again presents Munich on the East River, an unforgettable and traditional München Oktoberfest experience. 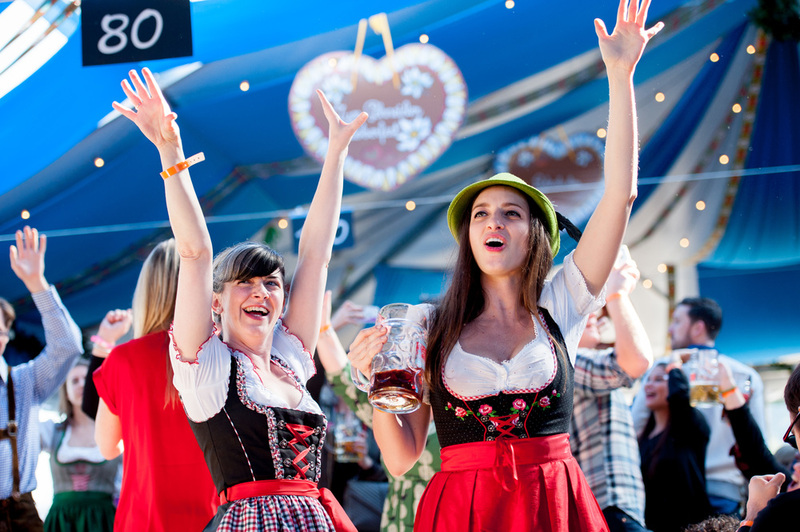 Zum Schneider hosts its annual event for the fifth time, by following the age old traditions of Oktoberfest typically celebrated in Munich for over 200 years. Fully decorated traditional Oktoberfest tent with original furniture (Garnituren), an Oompah band stage, general & reserved seating area and an elevated VIP section. 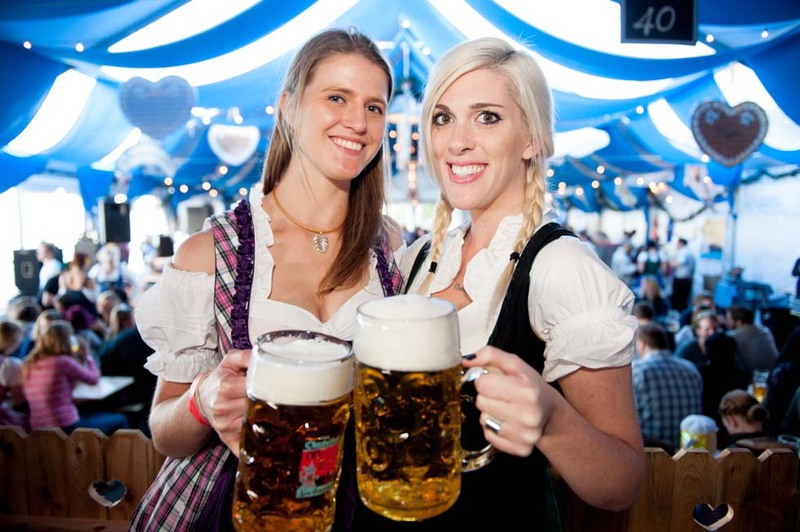 Original Oktoberfest beers on tap include: HB Traunstein Festbier, Andechs Festbier (both Zum Schneider exclusives in NYC) and Weihenstephaner Festbier, served in authentic Masskrügen = 1L glass Steins. Other drinks include white wine, German hard cider, soft drinks and bottled water. 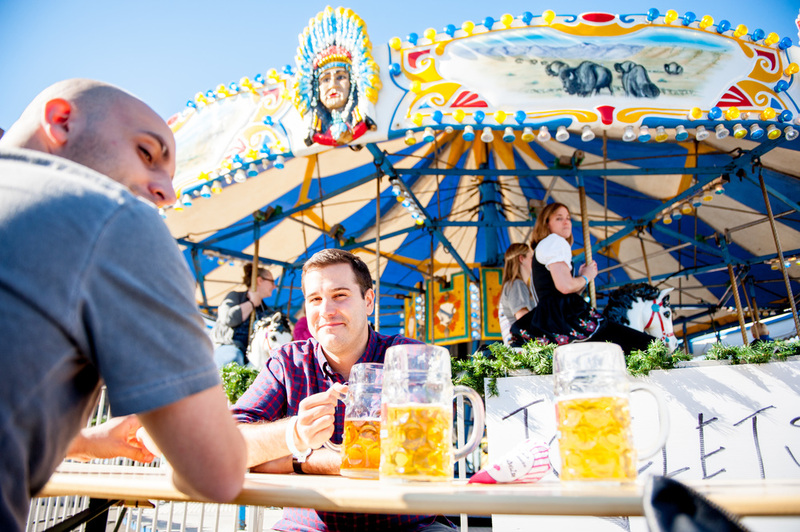 All food served in the tent is based on the traditions of the Munich Oktoberfest and includes: Wiesn-Hendl & Haxn (Oktoberfest roast chicken & pork shank), Giant Pretzels, Brat- and Weisswurst and much more. Vegetarian options available. See the full menu below. 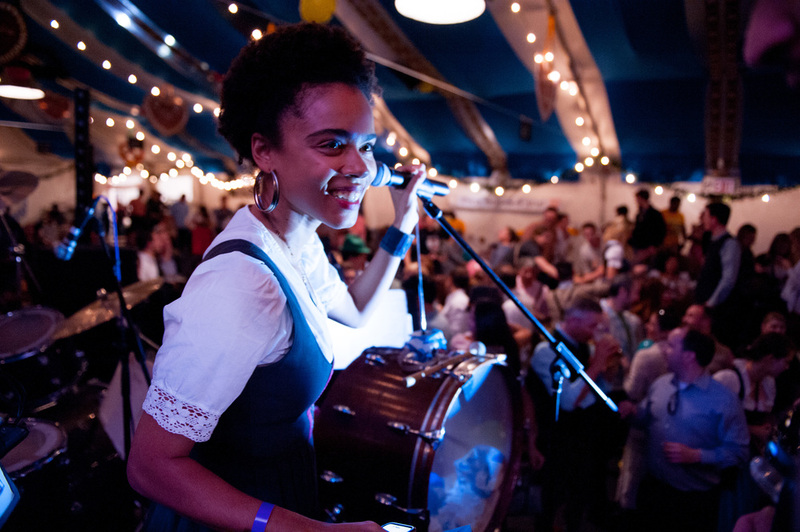 Live music with Mösl Franzi & the JaJaJa's plus special guests playing a variety of traditional Oompah music and Wiesn hits (modern hit songs and singalongs), starting shortly after doors open throughout the day/evening. DJ Volka Racho entertains in between sets. Vendor Stands outside the tent selling roasted almonds, cotton candy, gingerbread hearts, giant Brezn, Bratwurst, Steckerlfish (grilled mackerel) and more. For more fun there are strongman competitions, games and a photo booth. 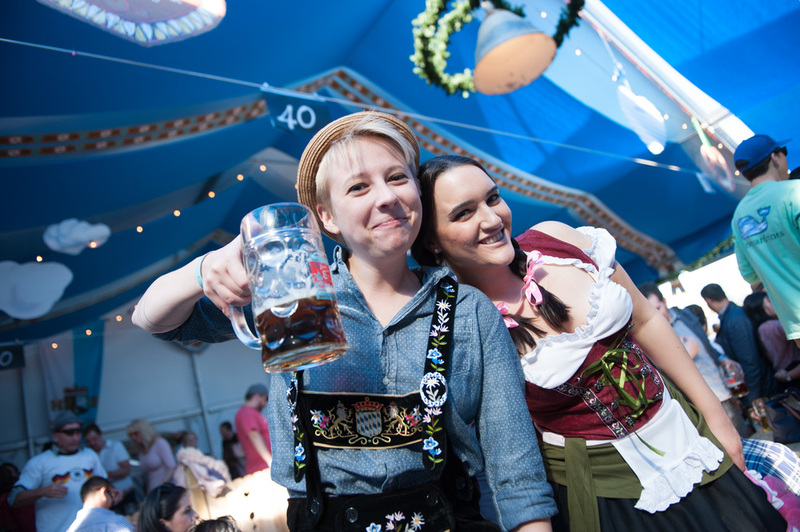 Staff fluent in German and English, dressed in Dirndl and Lederhosen. Free after party on most nights at the Zum Schneider restaurant (10 min. walk) with DJ Volka Racho. The restaurant stays open during Munich on the East River. No need for tickets, and everybody is welcome! First come first serve. No reserved seats. Table service. Valid all day. Additional tickets will be sold at the door if space becomes available, even if online sales is closed for the day. One table seats 10 people. Priority seating close to the stage. Hostess and table service. One table seats 10 people. If you buy multiple tickets, the hostess will seat your party together. On Saturdays, the 12:00-4:45 Early session must vacate the tent for the 5:15pm seating. Please designate a party name during ticket checkout. Elevated separate Boxen section close to the stage. Priority seating & table service. Dedicated entrance & toilets. One complimentary litre of beer per person and one appetizer platter per party. One table seats 10 people. If you buy multiple tickets, the hostess will seat your party together. Please designate a party name during ticket checkout. Dedicated grill and bar for self service (all days). Table service on Sat & Sun. Guaranteed seating (not reserved), valid all day. Umbrella covered. NO tent access, but you can upgrade if space becomes available. Entertain your friends or clients, reward your staff or meet new business partners. 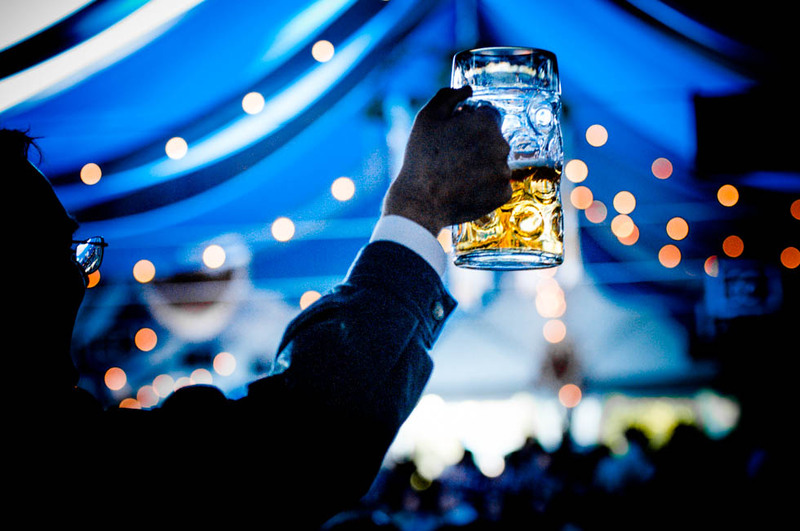 A relaxed and fun filled evening at our Oktoberfest tent will leave lasting memories. Act fast to grab a table close to the band (normally reserved seating), or in the VIP section. Food, beer, drinks and tax is included, but tips are NOT. If you have any questions, or want to buy more tables than are available for sale that day, please contact us at oktoberfest@zumschneider.com to find if we can find the room for you. Problems with the ticketing widget? Try the direct link. New in 2018: Our tent has its own ferry landing (Stuyvesant Cove.) Reachable from Long Island City and Wall Street. You will have a seat in general admission, however for reserved tables, please buy Reserved Seating (close to stage) or VIP tickets (elevated). Our Garnituren (tables & benches) seat 10 people. Large groups without reserved seating or VIP tickets are encouraged to arrive early, otherwise combined seating is NOT guaranteed. General admission access works with a revolving door concept throughout the day. Once people leave, new people will get access. Tickets will always be sold at the door, as they become available. All exits are FINAL. We accept cash & credit cards. ATM's will be on site as well. A 20% gratuity and a 8.875% sales tax will be added on all purchases. Ticket holders of the All-Inclusive Tables category are encouraged to tip our staff at their own digression. No smoking in the tent, but you can step outside. No pets allowed. Besides street parking in the area, there is also Skyport Parking Garage close by, on 2430 FDR Drive Service Rd E, New York, NY 10016, for $30 / day. Also check out quikparkgarages.com in the area for $34. Please don't drink and drive.